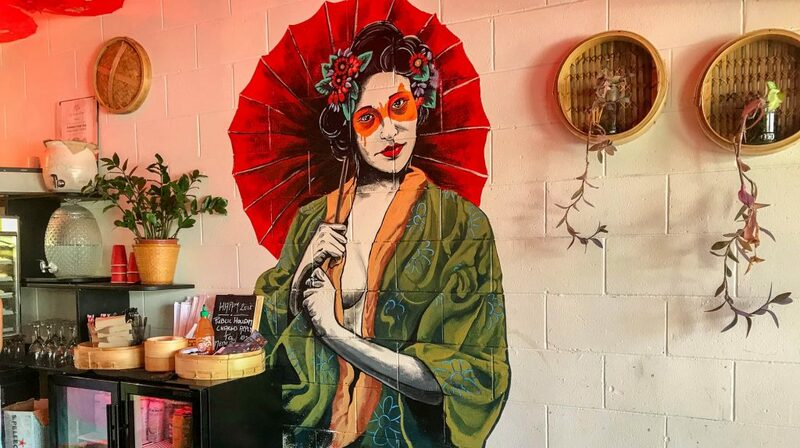 Tucked away in the Woolworths Plaza carpark in Byron Bay is a slip of an Asian street food den called Foxy Luu’s. Just look for the paper lanterns swinging in the sea breeze and you’ve found it. 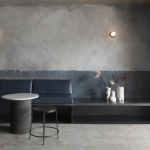 Open seven days for lunch and dinner, the little shop front serves a simple and freshly prepared menu of pan Asian street foods. It’s a great spot to call in for a fast and fresh fix of your favourite Asian snacks or for a light meal. The décor at Foxy Luu’s is loud. 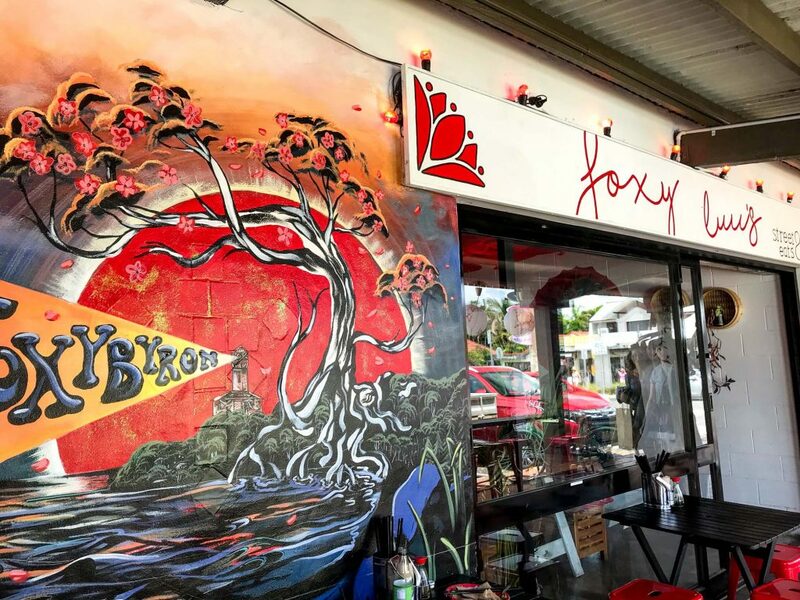 A bold mural of the Byron Bay lighthouse on the outside wall with a red rising sun welcomes you to ‘Foxy Byron’ and inside the hi-fi palette continues. 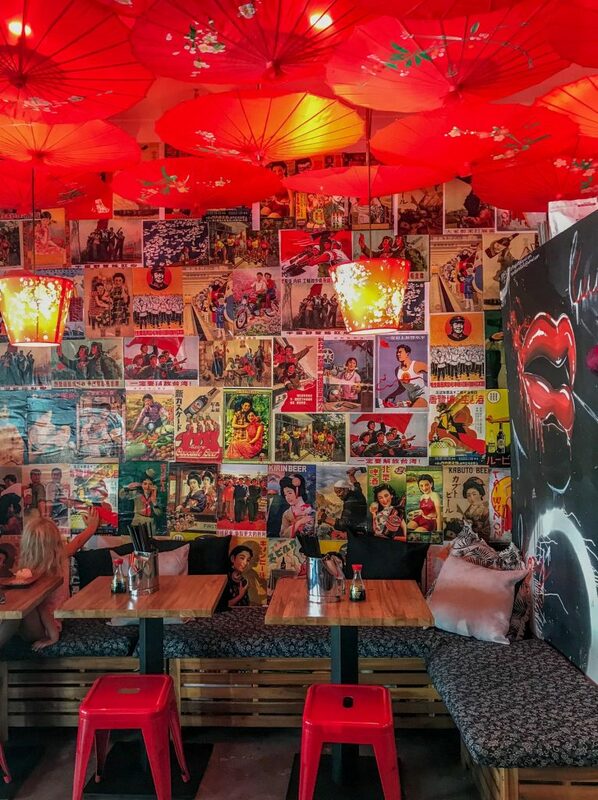 There is a collage of advertising posters and propaganda over one wall facing a spectacular mural of a mesmerising geisha. From the ceiling hang red parasols that act as lamp shades which add to the den like vibe. There are tables and short stools inside for around 20 with more dining outside. 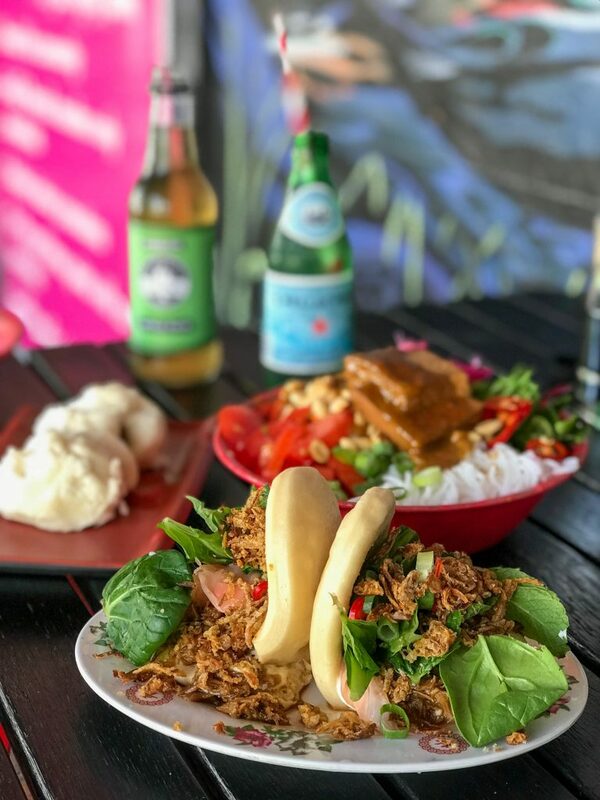 The menu at Foxy Luu’s starts with a selection of Taiwanese steamed buns known as Gua Bao or simply ‘Bao’ to us Aussies who like to shorten the names of everything! These are my favourite thing to order at Foxy Luu’s. 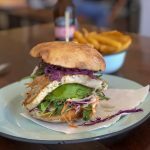 I am a fan of the Sesame Chicken Bao filled with chicken, mayonnaise, fresh herbs and greens and deep fried shallots. Other fillings include Sri Racha Tofu , Smoky BBQ Pork and a Satay Rainbow Salad for the vegans. Next stop on the pan Asian tasting journey is Vietnam for Goi Cuôn or Rice Paper Rolls filled with Chinese Pork, Satay Tofu or Sweet Soy Chicken. For something more substantial try a freshly prepared salad. The Indonesian Gado Gado comes with either Tofu or Chicken. It’s a bowl of rice noodles, fresh greens, tomato, peanuts and satay sauce. You can also add chilli for heat. The flavour is a bit flat for me but still a good lunch option. They also serve a Thai Papaya Salad which I’m yet to try. 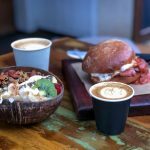 A nourishing Bone Broth served with Asian Aromatics can be ordered by the bowl or cup, which is a great option if you’re wanting to taste or share a number of small dishes as a meal. 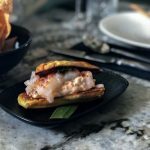 Another good idea is to do the $20 ‘Hawkers Degustation’ described as a marathon of bites. Then there is the Dumpling section – the ultimate Asian street food! Some call dumplings comfort food and others call them hangover food. Whichever your take, there are prawn and pork and vegetarian options. Foxy Luu’s also has classic pork buns from the steamer and bean curd rolls. For dessert there is a Coconut and passionfruit pana cotta, a Chilli chocolate mousses and a Custard bun with kaffir caramel, which they were all out of last visit (boohoo). The drinks fridge is all natural with juice, kombuchas, coconut water, oolong tea, sparkling and Pocari Sweat – a Japanese sports drink. You can also BYO. The Cellar bottle shop just outside! 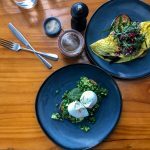 Foxy Luu’s is perfect for pan Asian street food snacks or a light meal. They do takeaway as well. 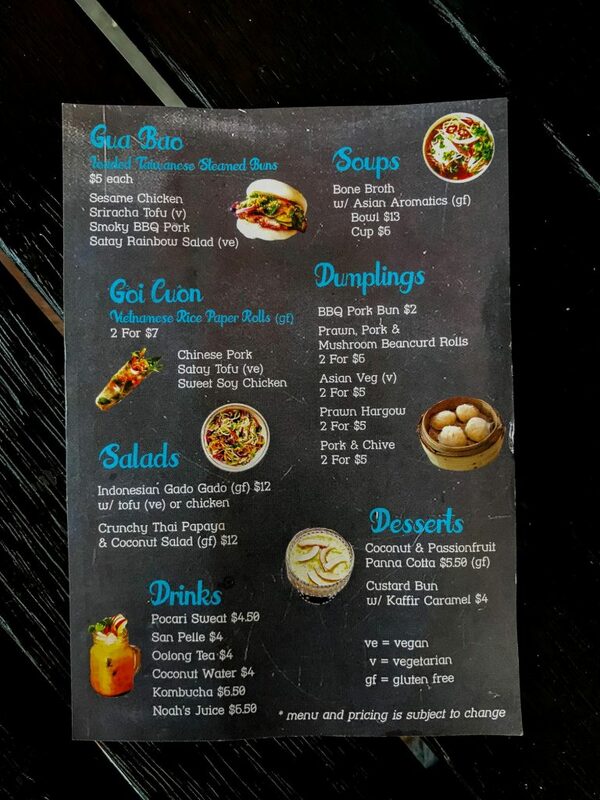 Make sure you try the Bao – it’s definitely my favourite street food taste on the menu.